There would have been no life on earth if energy was not available to let life breathe. The basic sustentation of human life is based upon the energy derived from the food we intake. Our stomach is one of the major reasons that we are able to live. The main function of the stomach is to process the food and convert it into energy, which is used by our body to perform the various functions required to live a healthy and a happy life. Our stomach is prone to various ailments and disorders, which generally can be cured by popping few pills or controlling our diet, but that too has side-effects. One alarming problem of the stomach is the cancer of the stomach, which is like a curse and is generally fatal, if not detected at an early stage. Stomach cancer is the buildup of an abnormal group of cells in the stomach, which together forms a tumor. The onset of this ailment is when cancer cells starts forming in the inner lining of the stomach. It is also known as gastric cancer. Research shows that it is the third biggest reason for cancer related fatality. The main reason for triggering the onset of cancer in one’s body is when there is a structural change in the DNA of a person, which leads to a disrupt in the instructions which control cell growth. 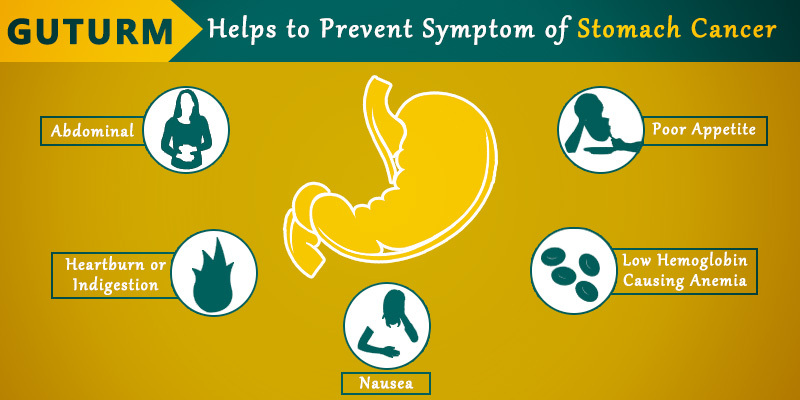 How to prevent stomach cancer? Making exercise a regular regime lowers the risk of getting affected by this disease. Eating a proper and well balanced diet and including more of vegetables and meat can also help in lowering the chances of getting this ailment. Saying no to smoking is one major step to eradicate the chances of getting stomach cancer. To choose a natural and an organic product is the key to successfully prevent and eradicate stomach cancer. Guturm by Bagdara Farms comes in rescue and is the ultimate solution for fighting stomach cancer. Guturm by Bagdara Farms is a purely organic and natural product, which is bubbling with the miraculous properties of the wonder phytochemical called curcumin and is enriched with the essential ingredients required to prevent and fight from the deadly disease called the stomach cancer. Guturm is one hundred percent herbal, vegetarian and is gluten free. It is free of any harmful chemicals and has no side effects. Guturm is a natural anti-carcinogenic, which has the ability to kill and prevent those deadly cancerous cells that kills our body slowly. Guturm has chemo-protective properties and helps in fighting off the chronic side effects due to chemotherapy. Guturm is a natural anti-oxidant, which helps in fighting off the oxidative damage to the cells of the stomach and increases their anti-oxidant properties dramatically. Guturm has anti-inflammatory property and helps in keeping a check on the stomach to fight off any irregular growth of cells. Dietary inclusion of Guturm on a regular basis helps in making the stomach cells stronger and keeps a check on them and eliminates any chances of suffering from stomach cancer. Buy your bottle of Guturm and shut the doors of your stomach for the most evil and unwanted ailment called the stomach cancer. Curcumin to slay breast cancer, can carcirid champion the cause? My tau ji was always very fond of eating the so called tasty food with lots of masala and oil. After a few years, he developed ulcers in his stomach which eventually turned into the inittial stage of stomach cancer. He was slowly becoming a skeleton due to the heavy chemo doses. Our ayurvedic doctor then suggested that we give him Guturm. Over a few months, his condition has improved and even though he is undergoing chemo sessions, his endurance towards it has increased.